Love trains? You won't want to miss riding aboard India's special Steam Express. This historic tourist train has the oldest steam locomotive in regular operation in the world. The train takes passengers on day trips from Delhi to the Rewari Railway Heritage Museum in Haryana. Here's what you need to know about it. Steam locomotives were introduced into India by the British and phased out by the early 1990s. However, Indian Railways apparently still has more than 250 of them, many of which are over 100 years old. A handful of steam engines pull toy trains on India's mountain railways and other heritage trains such as the Steam Express. Most are on display in rail museums across the country though. In recent years, the Indian government has focused on reviving its steam locomotives and returning them to the tracks for joyrides. 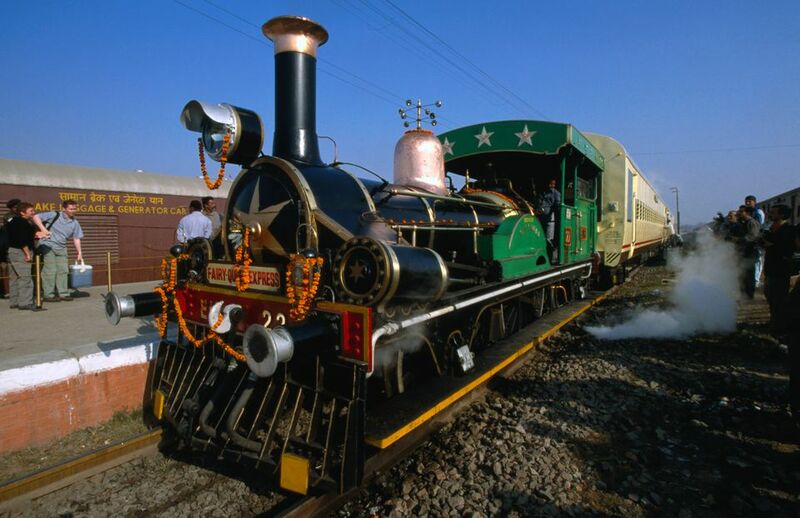 The Fairy Queen locomotive used by the Steam Express dates back to 1854, when it was commissioned by the East Indian Railway Company and labeled EIR-22 (East Indian Railway 22 class). The British deployed it on light mail trains between Howrah and Raniganj in West Bengal. Later, the engine ferried troops during the Indian Rebellion of 1857. Finally, it was sent to Bihar for line construction work before being retired in 1909. Post-retirement, the locomotive was displayed outside Howrah Railway Station in Kolkata for more than three decades. Next, it was moved to the Railway Zonal Training School at Chandausi, Uttar Pradesh, in 1943. The Indian government formally recognized the locomotive's heritage status in 1972. When the National Rail Museum opened in Delhi, in 1977, it became a feature exhibit there. Encouraged by the success of the Palace on Wheels luxury heritage train, the government later decided to restore the engine to working condition. It was launched as the Fairy Queen train in 1997, and undertook two-day excursions from Delhi to Alwar and Sariska Tiger Reserve in Rajasthan. The Fairy Queen was listed in the Guinness Book of Records as the "world’s oldest steam locomotive in regular operation" in 1998. In 1999, it won a National Tourism Award for the most innovative and unique tourism project. Unfortunately, tragedy struck in 2011. The Fairy Queen locomotive was extensively vandalized and looted at a railway shed in Delhi. The government kept the train operating by replacing the locomotive with a more recent WP 7161 steam engine known as Akbar, made in 1965, and renaming it the Steam Express. It took six years for the government get the Fairy Queen locomotive back up and running again. It's now housed at the Rewari Railway Heritage Museum and used by the Steam Express for special day trips. Some facts: the Fairy Queen locomotive weighs 26 tonnes and can reach a maximum speed of 40 kilometers per hour (25 miles per hour). It's a 5 foot 6 inch gauge locomotive with 2-2-2 wheel arrangement, developed by Robert Stephenson and Company in 1833. The locomotive is fired by coal and powered by two outside cylinders. Its tank can carry 3,000 liters of water. The WP 7161 Akbar steam locomotive is still used to haul the Steam Express at times, along with a WP 7200 class locomotive known as Azad. It was made in 1947 and imported from America. The WP class models were designed to Indian Railways specifications, and are lighter and faster. They're easily distinguishable by their cone-shaped bulging nose, usually with a silver star painted on it. Akbar may also be recognized from its appearance in numerous Indian movies such as Gadar: Ek Prem Katha, Sultan, “Bhaag Milkha Bhaag”, “Rang De Basanti”, “Gandhi My Father”, “Gangs of Wasseypur”, Pranayam (a Malayalam movie), and Vijay 60 (a Tamil movie). The Steam Express has a single air-conditioned carriage, which seats up to 60 people. The seats are in good condition with cloth upholstery. They're located in pairs, on either side of a wide aisle. The train has a large glass window at the front for viewing the locomotive, and a scenic observation lounge that provides excellent views of the countryside. It's also equipped with a pantry car for on board catering. Passengers get to spend a few hours at the Rewari Railway Heritage Museum before boarding the train back to Delhi. The Rewari Railway Heritage Museum was built as a steam locomotive shed in 1893. Apparently, it's the only facility of its kind that's still functioning in India. It was converted to a heritage museum in 2002, after falling into neglect and being rehabilitated. The museum was further extended in 2010. It houses 10 of the world's oldest restored steam locomotives, vintage railway equipment and signalling systems, gramophones and seats. Other attractions at the museum include a documentary about the history of railways in India, 3-D steam loco simulator, 3-D virtual reality coach simulator, a toy train, educational yard model train system, a century-old dining car, cafeteria and souvenir shop. The museum is open daily from 9 a.m. to 5 p.m. Entry is free. Future plans include a railway heritage theme park next to the museum. The Steam Express train operates from October to April each year. It usually departs twice a month, on the second and fourth Saturdays. The train leaves from Delhi Cantonment railway station at 10.30 a.m. and reaches Rewari at 1 p.m. On the return journey, it leaves Rewari the same day at 4.15 p.m. and arrives back in Delhi at 6.15 p.m. Passengers should arrive by 9.30 a.m. to see the locomotive being fired and take photos. Do note that a diesel locomotive may be used for the return leg of the trip. The cost of a round trip from Delhi is 6,804 rupees per person for adults and 3,402 rupees per person for children under 12. The cost of a one way trip, either from Delhi or Rewari, is 3,402 rupees per person for adults and 1,701 rupees per person for children under 12. Children under 5 years of age travel free. The rates include taxes, train trip, and visit to the Heritage Steam Shed at Rewari. Online bookings can be made here. In September 2018, Indian Railways introduced a new weekly steam train service between Farukh Nagar (a suburb of Gurgaon, about an hour from Delhi) and Garhi Harsaru in Haryana. Farukh Nagar has an old 18th century fort and is being developed as a heritage destination. The train, known as the 04445 Garhi Harsaru-Farukh Nagar Steam Special, runs on Sundays. It departs Garhi Harsaru at 9.30 a.m and arrives in Farukh Nagar at 10.15 a.m. In the other direction, the 04446 Farukh Nagar-Garhi Harsaru Steam Special departs Farukh Nagar at 11.15 a.m. and reaches Garhi Harsaru at noon. Tickets cost 10 rupees per person and reservations aren't necessary. The WP 7200 Azad steam locomotive is used to haul the train.